I know what you’re thinking – lobster is way too expensive. I thought so too until I found four glorious tails at Costco for $25. A splurge? For sure, but every once in a while, it’s wonderful to surprise your family with a really special meal. I’ve prepared lobster a number of ways, but working with raw tails is by far the easiest and cheapest. Don’t be intimidated. The prep is easy and the cook time is quick. 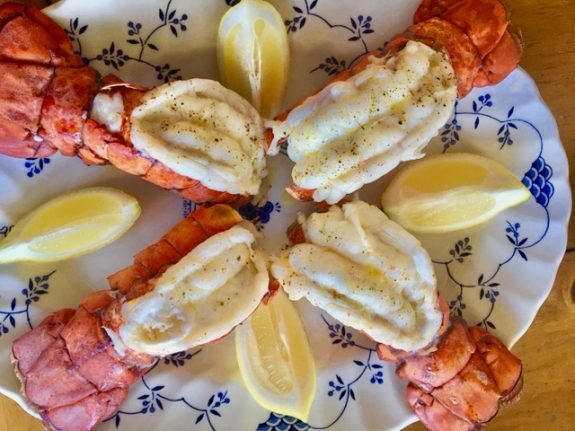 Drenched in lots of melted butter is pure perfection. Preheat broiler with rack 6-7 inches beneath heating element. Place lobster tails on a roasting sheet. With kitchen shears, slice through the shell lengthwise, toward the tail, leaving the last row or two uncut and still attached (See photo). With your thumbs, open up the shells to expose the meat of the tail. Liberally drizzle melted butter onto the tails. Sprinkle each with salt and pepper. Broil for 8-10 minutes. Broiling times may vary, but if you want to get these perfectly cooked, use an instant read thermometer. You want it right at 145 degrees in the thickest part of the meat. Remove from oven, display on a pretty plate with lemon wedges and go to town.